Altitude range: Around 3600-3800 metres above sea level. 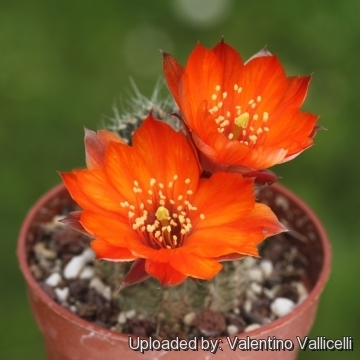 Description: Rebutia steinmannii var. 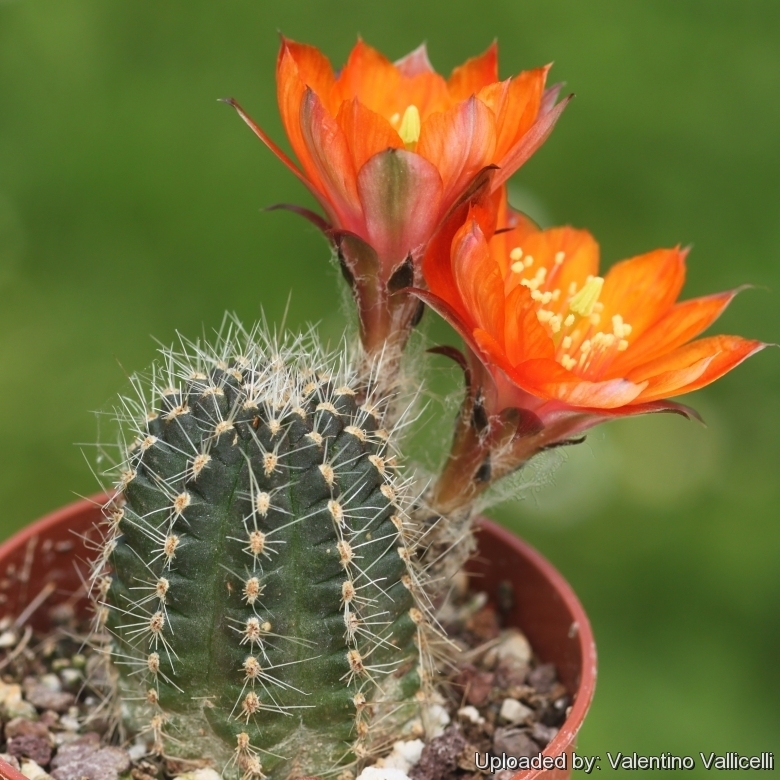 costata, formerly described as Rebutia costata by Werdermann in 1934, is one of the innumerable forms of the widespread and morphologically variable Rebutia steinmannii. It is a small cactus distinguished from the type species for its 8 or 9 straight ribs (a low count for this species). The names Rebutia steinmannii var. costata is not accepted by many botanists that treat it as synonym, but it still has a value for a collector because they identify plants with particular characters. Stem: Deep green, about 3 cm tall and 2 cm wide in cultivation. Spines: 11-12 usually all radial, 7 mm long, with with an occasional similar central spine (greyish-brown, thin, bristle-like). Flowers: 3 to 3.5 cm long and wide, orange-red, edged carmine, vividly coloured. Rebutia christinae Rausch: has flowers in shades of intensive orange. Distribution: Tarija, Bolivia. Rebutia huarinensis Kníže: has funnel-shaped, carmine red flowers. Outer tepals oblong, apiculate; inner tepals rounded. Distribution: Huari, Bolivia. Rebutia poecilantha F.Ritter: has flowers up to 40 mm long and wide crimson to purple, edged orange red. Distribution: North of Camargo, Chuquisaca, Bolivia. Rebutia steinmannii var. costata (Werderm.) Pilbeam: has 8 or 9 straight ribs (a low count for this species). Flowers orange-red, edged carmine. Distribution: Bolivia (La Paz, Potosi and Tarija) and Argentina (Jujuy). Cultivation and Propagation: Full sun to light shade, Water regularly in summer but do not overwater (the root system is rot prone) Keep dry in winter Hardy to -4°C. It is better that they are repotted regularly. Repotting will increase the number and size of stems and will increase the number of flowers produced. Repot yearly until reaching about 100mm in size, then every two or three years will suffice. Repotting is best done at the end of winter but can be done at other times. Do not water for a couple of weeks after repotting to reduce risk of root rot via broken roots.